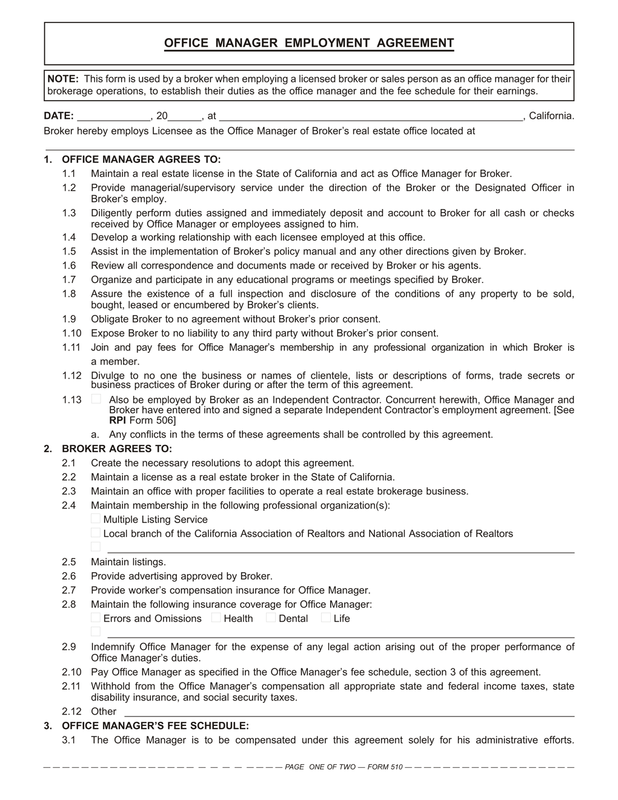 This form is used by a broker when employing a licensed broker or sales person as an office manager for their brokerage operations, to establish their duties as the office manager and the fee schedule for their earnings. In July 2015, nearly 12,000 individual and corporate broker licensees employed two or more real estate agents to represent them and render real estate services on their behalf. As employers of licensees, these brokers are required under the California Bureau of Real Estate’s (CalBRE’s) supervisory scheme to reasonably supervise the activities of their employees to protect members of the public with whom they deal. For the employing broker who is too busy to provide continuous oversight over all the licensees they employ, the broker may also employ a licensee as an office manager to carry out their supervisory responsibility to review documents and maintain files. The broker or office manager reviewing documents is to observe and take steps to correct any unacceptable documentation at the earliest possible moment. Without corrective activity, the broker becomes exposed to liability for money losses incurred by others through an error or other malfeasance committed by their agents. As an office manager, the manager owes the employing broker a duty to supervise all activities rising out of the operations of the branch or division they manage. In turn, the broker is responsible to clients for any breach in agency duty caused by the office manager’s failure to supervise agents and intercept and correct errors or omissions. Form updated 09-2015 to include the Form Description at the top, white header/footer convention and RPI branding.